Report Cards have been emailed! Baseball game today at Home vs Kirk Academy starting at 4:00. Track Meet at home tomorrow starting at 2:00. If you or any friend or family can work in the concession stand tomorrow or for any of our track meets, please call the office or Joe Noe (645-4369) to volunteer. We need your help! Any amount of time you can work is greatly appreciated! Reminder: Students, please try to sell your Colts and Crawfish tickets. Let’s reach that $25,000 goal to get a day off! Please turn in all tickets sold as soon as possible! Senior parent meeting at 5:30 Wednesday in the library. New members of Mu Alpha Theta need to return forms and money to Mrs. Tomlinson by this Friday. 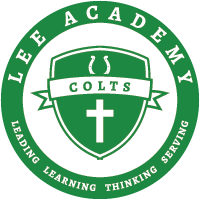 All Juniors, please bring a check or cash for $42.50 made out to Lee Academy to pay for your ACT weekday test. There will be a Lunch devotion time with Chris Cauthen Wednesday in library during HS and MS lunch times. Please come to the office and sign up if you plan to attend. Bring your own lunch . Dessert will be provided. The Lee Academy Junior Class will have an Easter Bake Sale on Tuesday, April 11th from 4:30 p.m.- 6:00 p.m. in the Commons. We will have a large variety of delicious Casseroles and Desserts. Thank you for your support! We hope to see you all there. Don't forget to bring bottled water for your monthly service project. Griffin's Run is this Saturday. Don't forget to turn in all registration forms to Raychel Lunceford this week if you are participating. Deadline for T-shirts has been extended to today.